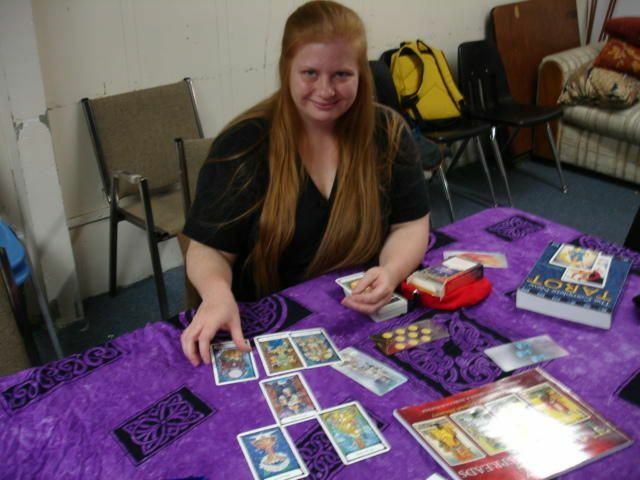 One of the classes I teach is Esoteric Tarot–reading tarot based on the astrological and qabalistic correspondences as systematized in Book T by Samuel MacGregor Mathers. Each year we are on a mission to find the perfect “cheat-sheet” deck–a deck that includes all the astrological associations printed on the cards. The class encourages memorization of this material (we even have weekly tests! ), but even for those who have worked hard to memorize it, when you are staring at a spread with 20-36 cards, trying to remember how to lay the cards out, how to count them, the elemental dignities, the qabalistic correspondences, and the astrology…it’s really nice if the cards provide a helping hand and show the correspondences clearly. One of the most frustrating things is the court cards–not all the decks include the astrological associations on the court cards, and when it’s standard iconography to show a crab on the Knight of Cups card–when a crab usually indicates Cancer, cardinal water, but the Knight of Cups is Pisces, mutable water…it’s enough to pack up a deck and give up. Today I am sharing with you five decks that include the astrological correspondences on all 78 cards, making them perfect cheat-sheets for reading the Opening of the Key and other Golden Dawn style tarot spreads. I also include a section for decks that have the correspondences on some cards but not all, a few examples of decks that have correspondences but are out of print, and some decks that use non-Golden Dawn astrological associations. For each deck, I link to the publisher first, the artist if self-published, or a site where you can purchase the deck if the first two options are non-existent or inadequate. And as a last resort for out-of-print decks, I link to Aeclectic.net (a great first stop for looking for decks!). I included a scan of a representative sample of cards for decks that I own and had close to hand. I hope you find this information as helpful as my students do! If you have any deck recommendations, or just want to leave a comment, please check out the contest described at the end of the post. Please also check out my free community webinar, An Astrologer’s Approach to Tarot, offered by Kepler College this Saturday, August 29, from 2-3:30 p.m. MDT. Celestial Tarot by Kay Steventon, Brian Clark, published by U.S. Games Systems, Inc. 2004. Win a Free 20-Minute Phone Reading! Have you used any of these decks? Which is your favorite? If you haven’t used any of them, which looks like one you would like? Let me know in the comments! Post a comment by midnight MDT August 31, 2015 and I’ll choose one commenter to win a free 20-minute phone reading. Also, if anyone can provide an in-print tarot deck (78 cards) not listed here that has the Golden Dawn astrological attributions printed on every card, let me know (in the comments or by email) by midnight MST December 31, 2015 and I’ll add it to the list and give you a free 20 minute phone reading. I’ve been invited to present a free community webinar at Kepler College next week: An Astrologer’s Approach to Tarot by Joy Vernon. Every card in the tarot deck corresponds to an element, mode, sign, decan, planet or combination of these. We’ll review how this astrological information came to be assigned to the cards of the tarot deck and learn a variety of techniques to make it easy for astrologers to add tarot to their repertoire. The webinar is from 2-3:30 Mountain time on Saturday, August 29. It will be recorded and registrants can download it for fourteen days after the event. Registration for this free webinar is required through Kepler College.